Perfect for a little getaway in the best powder in the east. This package includes 2 days skiing the best terrain we have to offer, with lifts up the hill either in our Catski, depending on the weather conditions. It also includes accommodation for 3 nights in our hostel, and 8 meals prepared by our chef. 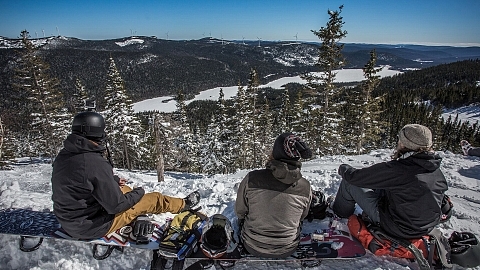 Pow Wow+ Package: Ideal package to enjoy all our available exclusive terrain. We lift you up for 3 full days in our Catski, depending on weather conditions, and you also get 4 nights accommodation and 11 delicious meals cooked by our chef. Comfort occupancy : Maximum of two people in a room. At least a double bed per individual or a private room with a double bed per couple. Economic occupancy : Maximized number of bed places. Possibility of two individuals in a double bed, an individual in a single bed or two couples in a two double bed room, according to availability. The Chic-Chac offers snow lovers backcountry skiing, downhill skiing on exceptional powder snow, Catski (12 passengers), and snowmobiling on groomed trails or off-trail and rides. All these activities take place on the large playground of the Chic-Chocs and last approximately 8 hours. It is now possible to heliskiing over the entire ski area of Murdochville. Food services, lodging, spa, wireless high-speed Internet. Equipment rental.